Entry level charcoal grills tend to have little in the way of special features. Most are a simple box or a kettle that can hold enough charcoal to handle searing some steaks, hamburgers, or bratwursts. The grill grates are usually either plated with temporarily shiny chrome or made from thin stainless steel. Both of which tend to stick to food like Spiderman sticking to the side of a skyscraper. As time goes on they also tend to corrode and rust like the hull of the Titanic. 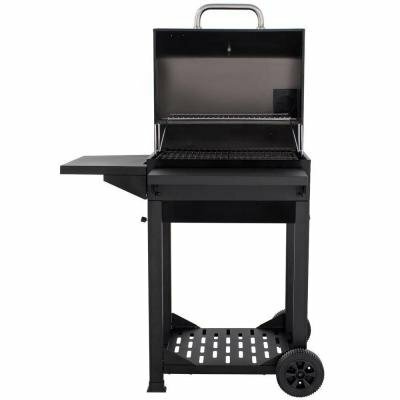 What you get with this unit stands out amongst other affordable entry-level charcoal grills. The grates are made from heavy duty cast iron that has been clad in a matte finish layer of porcelain. This helps prevent sticking, and makes for easier cleanup, while also providing superior heat retention in the grates themselves. There is a damper in the bottom and an adjustable chimney in the lid. You can play around with each to dial in the airflow and heat under the hood. The shelves also fold down to save space on your deck or patio. It also has the ability to adjust the height of the charcoal tray. 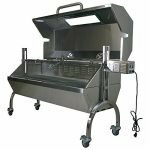 There are some high notes of quality and a few low notes when it comes to the material components in the Nexgrill Cart-Style Charcoal Grill. The porcelain coated cast iron grill grates are incredibly rare for grills in this price range. The thermometer in the lid is also not very common in this category of grill. That being said there are some areas where they clearly cut a corner or two to save on the price. Whether or not these things matter to you is the question. First off, the charcoal adjustment isn’t a crank style like you find in adjustable charcoal grills that are a step higher. Instead, it’s two stainless steel wire handles that you have to manually lift up. They can be awkward at times and can even get in the way. Honestly, you could just set it at the lowest setting, and you might not ever notice a problem. The warming rack is equally as cheap and gets in the way even more. I guarantee you that there will be an inopportune time when you will accidentally hook the warming rack with tongs or spatula. Unless you plan on using the warming rack all the time, I would just leave it off. If you do need a warming area, I would just recommend building the coal bed a little bit off to one side. Another drawback of the Nexgrill Cart-Style Charcoal Grill is the overly complicated assembly and poorly drawn up instructions. Even a Buddhist monk would be hard pressed not to swear at some point while putting it together. 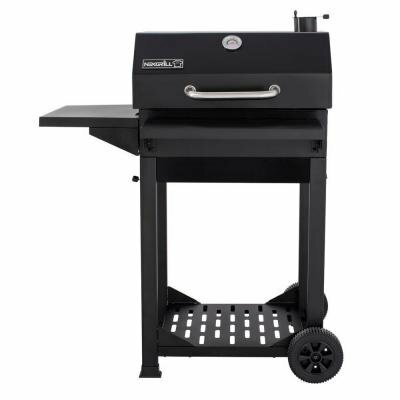 The Nexgrill Cart-Style Charcoal Grill will do just about everything you need an affordable charcoal grill to do. The 390 square inch grill grate is big enough to grill up steak, chicken breasts, or burgers for four or five diners. Just make sure to let the cast iron grill grates absorb the heat of the fire for a maximum flavor sear. The lower damper and the smokestack in the lid don’t necessarily have to work together. If you want superior heat control, you should start by setting the lower damper about 75% open, then leave the smokestack lid open a crack. At that point the more you open the smoke stack the more oxygen will pass through, to give you a nice, hot fire. Just make sure that you close the smokestack all the way when you are done grilling. If you leave it open rain will flow down into the firebox. When this happens, it will mix with the lingering bits of ash to form a corrosive paste. In time, it can cause rust and shorten the overall life of the grill. 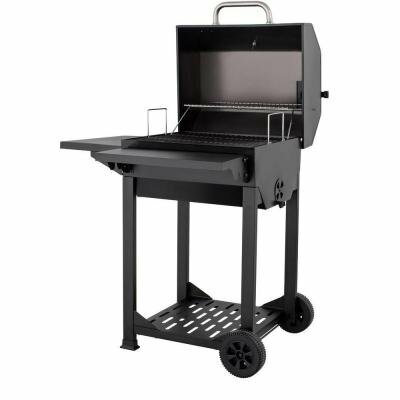 The Nexgrill Cart-Style Charcoal Grill has 390 square inches of cast iron grill grate cooking space. This is more than enough to handle a large batch of food. The warming rack rings in at 185 square inches. The adjustable charcoal tray is pretty much unheard of in a grill with this friendly price point. However, it is somewhat difficult to adjust even when the grill is cold, let alone when it’s hot. If you do need to adjust it in the middle of a grilling session, I would recommend investing in a pair of welding gloves, as oven mitts might not be able to resist the heat. The thermometer in the lid might seem like something you’d expect as standard in a grill a class or two up in price. Yet it’s pretty rare in a grill this inexpensive. On the one hand, the grill grates on this grill are very easy to clean. They just need a quick scrape down to release any straw debris from the porcelain coating. On the other hand, the ash in the charcoal box can be frustrating. To be able to get it all, you have to pull out the awkward adjustable charcoal tray. Then you have to manually scoop it out with a cup. Just be sure to put the ash in a metal bucket or an old tomato can with some water to put out any stray embers. Once you’re sure everything is cool, you can dispose of the can. 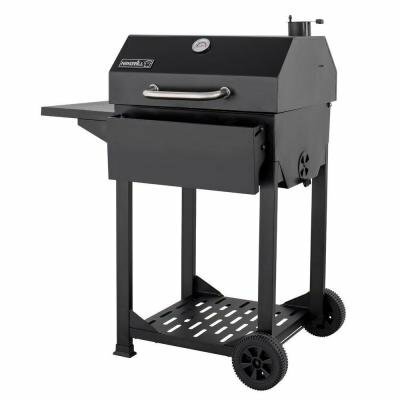 The Nexgrill Cart-Style Charcoal Grill comes with a 1-year warranty. This is pretty much on par. Some competitors don’t even offer a warranty in any form for a grill in this price range. 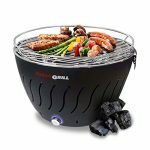 If you are looking for an affordable grill that has more features than your basic charcoal kettle, the Nexgrill Cart-Style Charcoal Grill might be the one for you. You are just going to have to accept some minor flaws in the charcoal adjustment tray and the obstructing warming rack.